Pebble Time is a smartwatch developed by Pebble Technology and assembled by Foxlink, released on 14 May 2015. This is the first Pebble to introduce a color e-paper display, as well as a microphone, a new charging cable and a new Pebble Time-optimized operating system. In early 2015, Pebble announced the product, as well as its fundraising on Kickstarter. The watch received $1 million in 49 minutes, breaking a current record, and became the most funded Kickstarter to date, reaching $20.4M dollars all the way to its deadline, from over 78,741 backers. After releasing the Pebble Smartwatch, on 24 February 2015, Pebble CEO Eric Migicovsky announced the Pebble Time, the second generation smartwatch of Pebble. Pebble's smartwatches connect to both Android and iOS phones, and using a Bluetooth connection, run native apps that control music on the connected smartphone, display calendars, show fitness/sleep data from Pebble Health, and allow users to set timers. Pebble also has an app store where users can download apps from companies including RunKeeper, ESPN, Uber, Nest, TripAdvisor, Pandora Radio, and Yelp onto their watches. Users can also respond to text messages with the Pebble's microphone, check the weather, create checklists, make voice notes, and view Google Maps directions. Pebble Time uses Pebble OS version 3.0. This OS is compatible with its color e-paper display. The OS features updated transitions between screens which "morph" into other features due to the constrained space of the watch's face. The OS version is also backward compatible with other features in previous versions of Pebble OS. It works with apps, watchfaces, and settings tailored for Pebble OS v. 2 or lower, as well as its predecessors. 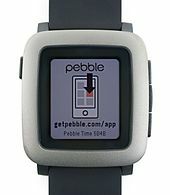 Pebble Time still retains most of the features from the original Pebble smartwatch, such as Bluetooth connectivity, and is currently only compatible with the smartwatch itself. Timeline is a new feature on Pebble OS 3, which currently is only compatible with Pebble Time. It enables the wearer to look at past and future notes, either reminders, alarms, app notifications, scores, weather reports or others. The completed or viewed notifications, ESPN scores, and calendar events are in the "past" section, which is highlighted yellow. The future calendar events, weather reports, or reminders are in the "future" section, which is highlighted blue. To access either, the wearer uses the buttons to look at desired information. The smartwatch comes with a Gorilla Glass 64-color e-paper always-on display developed by JDI with 144x168 resolution and has a pixel density of 182 ppi. This is the first Pebble smartwatch to have a color display, and still retains a LED backlight as well. The watch also has a vibrating motor for silent alarms, and smart notifications. The watch comes with a redesigned charging cable that, like its predecessor's cable, magnetically attaches itself to the watch in order to maintain its water resistance. Unlike its predecessor, the cable attaches to the back of the watch rather than the side, and has the potential to transfer data rather than just power. The band attaches with standard 22 mm pins. The watch is also equipped with an ambient light sensor and 6 axis accelerometer. Pebble Time, as a feature, has a small accessory port on the back of the watchface. Pebble Technology, Corp announced on its developer site that it is possible to create accessory ports on watchbands, otherwise known as "smartstraps". It enables the wearer to attach additional equipment to the watch, including sensors, batteries, and miscellaneous. As a hazard, the "smartstraps" will affect the watch's battery life. As of summer 2015, the "smartstrap" API is still in beta testing. Two smartstraps were funded on Kickstarter so far: the Pagaré strap, which gives Apple Pay-like contactless payment features to the Pebble, and the Tylt Vü strap, which gives Qi capabilities to the Pebble, as well as heart rate measurement. The Pebble Time Steel is a variant of the Pebble Time, with a steel and leather style and 10-day battery life, while retaining full waterproofing and all of the Pebble Time's features. It has a Marine Grade steel chassis encasing it, with bezel and a PVD matte polishing finish, a 2.5D color e-paper display, and depending on color finish, comes with either a 22 mm Italian leather band with stainless steel PVD-coated buckles and "Quick Release" pins, or a 22 mm stainless steel band with PVD coating and detailing sold separately. The Pebble Time Round is a variant of the Pebble Time. It was available for pre-order on September 23, 2015. The watch includes a 2-day battery with 15 minutes of charging giving the watch one day of battery life. The watch has the same 64 color e-paper display as the other Pebble Times. It was available with two watch strap sizes: 14 mm and 20 mm with different color combinations for each size. The Pebble Time Round has all the same features as the Pebble Time, including the microphone for dictating text message replies, but featured a thinner, round style. The Pebble Time 2 is the second version of the Pebble Time. It was announced via Kickstarter on May 24, 2016. The Time 2 features a larger 228x200 1.5 inch color display, an optical heart rate monitor and improvements to Pebble Health. The Time 2 has all the same features of previous Time models. The Pebble Time 2 was never publicly released due to the insolvency of Pebble. Critics have praised the battery life, Android support, and color screen, but have derided its Apple support, its "retro-techie" design, and its overall quality. The Verge gave the watch a 6.8 on its score, summing up by saying that while it's fun at some points, "the Pebble Time doesn't do enough to change that." CNET also gave it 3.5 out of 5 stars for the editor's rating, and a 7.8 overall, saying that "[the] Pebble Time adds a few key improvements and a color screen..., but owners of previous Pebble[s] may not see a need to upgrade yet." Digital Trends gave it 2.5 out of 5 stars, praising the battery life, screen, design, and water resistance, but derided its software support, design, settings, interface, and price, saying that "Pebble has been left behind." Tom's Guide gave it 3.5 out of 5 stars, concluding that while it isn't the perfect smartwatch, "it's the most practical wrist companion for Android" Wired gave it a 6/10, and summed up its use by saying that they want the idea, "[but not] the watch." PC Magazine gave it a 4 out of 5, stating it "excellent" and as an "Editor's Choice", saying that "[it's a] solid choice for first-time smartwatch buyers." CNET gave it 3.5 out 5 stars for the editor's rating, but a point higher compared to Pebble Time for its overall rating, stating that "[it's better] as a more budget-friendly watch." Tom's Guide gave it 3.5 out of 5 stars, saying that it's "the company's most luxurious smartwatch to date, but it's a better choice for Android users." ^ a b "Pebble Time Teardown - iFixit". www.ifixit.com. iFixit. Archived from the original on 19 August 2015. Retrieved 9 August 2015. ^ a b "Pebble Time - Specs, Reviews, Ratings". smartwatches.specout.com. FindTheBest.com. Archived from the original on 2 May 2016. Retrieved 9 August 2015. ^ "Introduction To Pebble Time". GetPebble Support. Archived from the original on 2016-03-05. Retrieved 2016-02-28. ^ "Pebble Kickstarter Pebble Project Updates". www.kickstarter.com. Kickstarter. Archived from the original on 19 August 2015. Retrieved 9 August 2015. 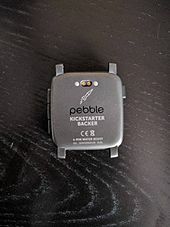 ^ "When the Crowd Met Pebble: A Story of Kickstarter Success". The Huffington Post. Archived from the original on 2016-03-21. Retrieved 2016-02-28. ^ "Most Successful Kickstarter Campaign Product". Retrieved 17 June 2016. ^ "Say goodbye to these Pebble smartwatch features on June 30". ^ "The best apps for Pebble and Pebble Time". Wareable. Archived from the original on 2016-03-04. Retrieved 2016-02-28. ^ TechnoBuffalo. "Pebble Time: Top 5 features of Pebble's amazing new smartwatch". TechnoBuffalo. Archived from the original on 2016-03-07. Retrieved 2016-02-28. ^ "Crunch time: can a new Pebble smartwatch make it in an Apple world?". www.youtube.com. The Verge. Archived from the original on 5 September 2015. Retrieved 12 August 2015. ^ a b Seifert, Dan. "Pebble Time review". www.theverge.com. The Verge. Archived from the original on 20 August 2015. Retrieved 23 August 2015. ^ "Chapter 2: Hardware Specifications – Pebble Watch Owner's Guide | Smartwatch Accessories". Smartwatch-Accessories.com. Archived from the original on 2016-03-09. Retrieved 2016-02-28. ^ "Building Smartstraps // Pebble Developers". developers.getpebble.com. Pebble Technology, Corporation. Archived from the original on 24 August 2015. Retrieved 23 August 2015. ^ "Inside Pebble: The Smartstraps you'll be wearing in 2016". Wareable. Archived from the original on 2016-03-04. Retrieved 2016-02-28. ^ "Pebble Time Steel review". Wareable. Archived from the original on 2016-03-04. Retrieved 2016-02-28. ^ "Review: Pebble Time Round". Wired. Condé Nast. Archived from the original on 2016-02-27. Retrieved 2016-02-28. ^ "Pebble Time 2: Everything you need to know about the fanciest Pebble watch". Wareable. Archived from the original on 2017-02-07. Retrieved 2017-02-07. ^ Stein, Scott (27 May 2015). "Pebble Time review - CNET". www.cnet.com. Archived from the original on 17 August 2015. Retrieved 23 August 2015. ^ Gokey, Malarie (7 July 2015). "Pebble Time Review: The Grandfather of Smartwatches Shows its Age". DigitalTrends.com. Designtechnica Corporation. Archived from the original on 22 August 2015. Retrieved 23 August 2015. ^ Piltch, Avram (22 June 2015). "Pebble Time Smartwatch Review". www.tomsguide.com. Tom's Guide. Archived from the original on 29 August 2015. Retrieved 23 August 2015. ^ Pierce, David (27 May 2015). "Review: Pebble Time". Wired. Condé Nast. Archived from the original on 4 September 2015. Retrieved 23 August 2015. ^ Stein, Scott (6 August 2015). "Pebble Time Steel review". CNET. CBS Interactive. Archived from the original on 21 August 2015. Retrieved 23 August 2015. ^ Palladino, Valentina (21 August 2015). "Pebble Time Steel Review". www.tomsguide.com. Tom's Guide. Archived from the original on 25 August 2015. Retrieved 23 August 2015. This page was last edited on 23 March 2019, at 20:49 (UTC).